The Patz 800 series single screw TMR vertical feed mixers from Dom Distribution are a simple design for a better bottom line and offer thorough mixing and a fast and superior clean out process. 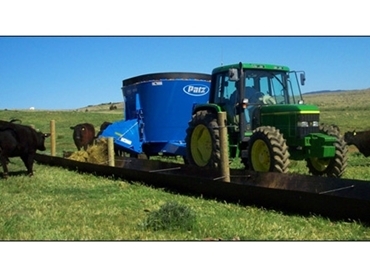 Ideal for livestock such as dairy, heifers, and cow-calf’s, the vertical feed mixers can handle a number of ingredients including loose and baled hay whether it’s wet or dry. Other ingredients could include high moisture corn, oats, wheat, barley, distillers and fescue hay. Using a large vertical screw, the mixer mixes quickly whilst maintaining a feed integrity and produces a thorough, consistent TMR. The feed is then pulled away from the bottom of the mixer walls by a screw which allows for more material to fall once the screw lifts the feed. After this process the screw moves the TMR to a discharge area and then it exits the mixer for distribution.